I’ve been gearing up for our Burger Extravaganza it starts June 1st. So what do you serve with those burgers? Fries of course! If you follow/fan us on FaceBook you’ll be able to keep up with what delectables are coming up – there are even a couple of sneak peek photos! Since we pack a lot of calories in those burgers, I like/try to keep the accompaniment on the less greasy side. These Crispy Sweet Potato Fries are just the ticket to burger and fries BLISS! I like them even better than regular deep fried fries! That may not sound like much, but one of my nick names is pomme frite. What’s the trick? A coating on the outside and baked up in a REALLY HOT oven: set-off-the-smoke-alarm HOT! Peel, rinse and cut into strips – the thinner the strips the faster they cook! Drain and spray with COLD water to stop the cooking – you DO NOT want mush! Sprinkle Spice Mix over a couple tablespoons at a time and mix after each addition. It will become gooey which means crispier fries, but don’t over-work it! Spray a pizza screen WELL and distribute fries so they don’t over-crowd each other – you don’t want to steam them! Bake for 20 minutes and check on them – keep checking every 5 or so minutes so they don’t burn – cooking time will vary based on the thickness of your fries. You could bake on a cookie cooling rack too – I haven’t tried it on a sheet pan yet, but think I will next time, these stick a lot if you don’t spray well! I will try these with the coating next time…. Nice – I prefer sweet potato fries too – fewer carbs. I’ll bet if I teach the kids how to make these we’ll have them all summer long. I have a true love for sweet potato fries. I forgot how easy they are to make, thanks for reminding me! I love me some Sweet Potato FF! I will have to try your recipe out. When I used to make them at the restaurant I made a great dipping sauce for them. I would get a tub of the whipped butter and let it come to room temperature. Then I added maple syrup, a touch of vanilla, nutmeg, cayenne & blended it good. But, the reason behind switching to sweet pots and the no grease was to AVOID extra calories. Those are my all time favorite snack! And this version is far healthier to what I am used to. Mmm. I heart potatoes, especially in french fries format! So is the secret the egg white coating? They look spicy and tasty. looks great! i love sweet potato fries baked, but have never tried them with the egg white. we’ll have to try that next time. great post! Sweet Potato Fries are so good, thanks for sharing! I love sweet potato fries. Last season I was grilling my fries and they were good, but this recipe looks awesome. I’m going to have to try your recipe. Love sweet potato fries, especially the less guilty conscience kind! No grease!! You are talking to me now. As far as I love to eat fries. I hate actually frying them. Love sweet potato fries, but have not been able to get them exactly right. Will be trying this. This sounds so so good and I know it will be a winner at our house. I can’t wait to try this..fries..without the frying..fabulous! Ok – those have got to be some of the best looking sweet potato fries I have ever seen! Sweet potato fries are the absolutely best fries you can get! I adore fries, especially sweet potato fries! Mine usually come out soggy. I can’t wait to try this recipe! This reminds me of something that Oprah’s personal chef Rosie did with regular potatoes, but using sweet potatoes is genius, and so much healthier–and I love the spice mixture here. Thank you for a great recipe! I have that cook book – I think I’ll go dig it out, now that you’ve reminded me. I love sweet potato fries – your fries look fantastic! I wish I had some for lunch today. I ADORE sweet potato fries, but I’ve never known how to get them as crispy as I want. Now I know!! Thank you!! I love sweet potato fries. I never thought about using a pizza screen to help crisp them up more. Thanks for the idea. These were really good! I have recently been trying to get crispy sw potato fries and nothing worked. I will try it next time without the flour, I’m curious if it would work. So glad you liked them. Please, if you do try them without the flour, come back and let us know how they turned out. 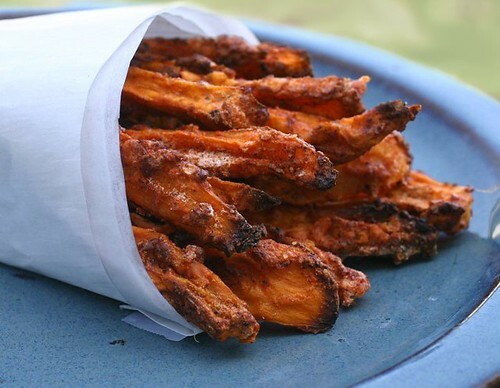 I have been making sweet potato fries like this for a long time a couple tips though… try corn starch instead of floor they come out even crispier, and line your pan with wax paper or parchment paper and they never stick!! and you can use even less oil!! Thanks for the tips! I’ll give it a go the next time ’round. These were great! I have been married for two years and somehow, with the ring, came the cooking! 🙂 I have been trying to cut calories anywhere I can (my hubby despises “diet food”) and every time I have tried sweet potato fries, they are basically the same as a baked sweet potato. These were outstanding. I made my own meatball sandwiches and these were perfect on the side. Thanks so much! Tried it on a cooling rack— came out dry and hard. That will happen if you cook them too long. I got side-tracked the last time I made them, and unfortunately it was the time I sliced them the thinnest. Needless to say the kitchen was a tad smoky and the the fries turned out as yours: dry & HARD! I just tried these with just salt, egg, and cornstarch. They were amazing, perfectly crispy, not bland at all. Next time I have to try the parchment paper though. Great to hear, thank you for coming back and letting us know! Fantastic! Worked great with Gluten Free flour, too. Tried your recipe with Okinawan (purple) sweet potatoes. Dipped them in home made Mango BBQ sauce. Loved it! I baked with convection setting and started to have a burn at 20 min. Next time I’ll do 18. Your instructions were great. Thanks! I wish I had a convection oven, I envy you! This is the best way I’ve seen to get baked fries crispy. Love it! Thanks for posting this. I’ve had good sweet potato fries, and bad sweet potato fries. The bad ones are always too greasy and end up being soggy. These look like the right way to make them. Will be giving this a try soon!